Below is a list and brief description of the procedures and services offered by Cardiology of Atlanta at our office based facility and/or at our affiliated institutions (St. Joseph’s Hospital of Atlanta and Nortshide Hospital). For further information or questions regarding these procedures and tests please do not hesitate to contact our office. You may also find additional information on the “tests” section of Cardiosmart.org. Cardiosmart.org is an educational resource provided by the American College of Cardiology for cardiac patients and for the general public. Cardiac catheterization is a technique that uses long thin tubes called catheters, about the size of a spaghetti noodle, that are used to measure pressures in the heart chambers and blood vessels, and it also allows your doctor to obtain images of the coronary arteries (the arteries that provide blood flow to the heart muscle), also known as coronary angiogram. Coronary angiography is a technique that uses X-Ray dye injection directly into the coronary arteries, so that these arteries can be visualized with an X-Ray machine. It creates a motion picture of the arteries that allows your doctor to determine with a very high degree of precision if there are any blockages in the coronary arteries. To perform a cardiac catheterization your doctor introduces a small “IV-like” tube in a vessel of the leg or the arm, and through that entry port the catheter is introduced and advanced into the heart chambers and into the orifice where the coronary arteries arise from the root of the aorta. During the procedure, the patient receives mild sedation for comfort purposes. In most cases, catheters do not cause any sensation or discomfort when placed inside the body so more profound degrees of sedation are usually not required. A diagnostic cardiac catheterization can take approximately 20 minutes to complete and the results are available immediately. When coming to the hospital for cardiac catheterization it is recommended for the patient to bring a relative or friend as driving is not allowed the same day after receiving sedation. In many cases cardiac catheterization is an outpatient procedure that can be scheduled from the office. CT is a radiographic test that uses X-rays to image the body in multiple “slices” which can be reconstructed in 3-dimensions using computers. Cardiac CTA uses an injection of intravenous contrast, similar to that used in cardiac catheterization, with subsequent CT imaging to outline the coronary arteries. These are the vessels which bring blood flow to the heart muscle and can become clogged leading to heart attack. This test can visualize plaque build-up and calcium in your coronary arteries and help your doctor plan how to best treat atherosclerosis. CTA also gives information about the structure of the heart and what is known as ventricular function, or simply said the “strength of the squeeze” of your heart. CTA is not for everyone. It is used in patients who have had chest pain with an unclear source or when other types of cardiac stress testing do not give clear answers. Patients who have an irregular heart beat or kidney problems cannot undergo cardiac CTA. 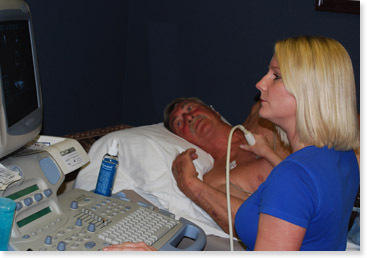 This test can be performed as an outpatient and takes only about thirty minutes to complete. Coronary Intervention is done in a way very similar to cardiac catheterization (please review the section on cardiac catheterization and angiography). The difference with this procedure is that your doctor will be able to treat blockages in the coronary arteries using balloons and stents to stretch or widen the areas of blockage inside the coronary arteries and therefore restore adequate circulation through those arteries. Balloon angioplasty uses a small balloon with the shape of a sausage or small cylinder which is inflated inside the coronary artery at the site of the blockage. A stent procedure is similar in many ways to the angioplasty, but in addition to a balloon being inflated at the site of the blockage, a small slotted metal tube or “mesh” of very thin metal is deployed at the site of the blockage to allow better support of the arterial wall, and prevent recoiling or re-narrowing of the vessel. There are many different types and brands of balloons and stents and they come in many sizes and lengths. Stents are usually made of metal alloys such as stainless steal or cobalt-chromium combinations. Stents are also made of either metal alone (bear metal stents) or they can be coated with medications (drug eluting stents). Drug eluting stents are very effective in preventing re-narrowing from excessive scar formation due to reaction of the body to the stent materials. In many cases coronary intervention with balloon angioplasty or stenting can be used to treat blockages of the coronary arteries. However, when the blockages are very extensive or located in certain critical areas the preferable solution is bypass surgery. Coronary intervention is widely used for the treatment of chronic blockages of the coronary arteries, and is the best available treatment for heart attacks. In emergency situations coronary intervention can be done at any time of the day or night, in hospitals equipped and staffed for 24/7 service, such as St. Joseph’s Hospital of Atlanta. MRI is a method of imaging the body that uses a large, “doughnut-shaped” magnet that a patient is placed into during the exam. The magnet creates an alignment of a subatomic particle the proton (or hydrogen ion) contained in the body’s water, and then measures how fast these protons return to their relaxed state. Cardiac MRI is a relatively new technique whereby MRI is used to create images of the heart and blood vessels. A wide variety of cardiac conditions can be examined using Cardiac MRI including coronary disease, heart failure, valvular heart disease, congenital heart disease, and vascular disease. Not everyone can undergo an MRI. Patients who are severely claustrophobic may have difficulty, but sedation can be used to help patients relax during the test. Anyone with implanted metal in their body, such as pacemakers, defibrillators, cerebral aneurysm clips, and cochlear implants, cannot have an MRI. MRI is performed on an outpatient basis and can last up to an hour, depending on the condition being examined. Transthoracic Echocardiography, or simply echo, is an office-based examination that uses reflected sound waves to create images of a patient’s heart and blood vessels. The test is performed using an ultrasound probe placed against the chest wall and usually takes about 20 minutes to complete. Information about heart structure and function can be obtained; this includes heart size, valvular function, ventricular function or “squeeze” of the heart, and an estimation of pressures inside the heart. Patients with emphysema or those who are very obese or have very large chests may have poor quality studies and be better imaged by other means. Transesophageal echocardiography, or TEE, is a test that uses reflected sound waves to evaluate the heart, in a similar way to the transthoracic echocardiogram. The difference is that it is done using an endoscopic transducer that the patient swallows under sedation. It is often used when regular echo doesn’t answer the question, because TEE can provide more detailed images of the heart chambers, the heart valves, and the great vessels arising from the heart. It is often used to more thoroughly evaluate for infection of the heart valves, cardiac masses or clots, abnormal communications between chambers, and diagnose aortic dissections. Patients cannot eat prior to the test but can take home medications with sips of water. The test is done in a hospital setting and the patient will need a relative or friend to drive home because it is done with sedation. Electrocardiogram, or simply EKG, is a test to measure the electrical signal of the heart for about 10 seconds using 12 electrodes placed on the chest. It provides information about heart rhythm, electrical conduction through the heart, heart size, and presence of heart attacks. This study is used to test for blockages of the coronary arteries. The patient is monitored using continuous electrocardiogram and intermittent blood pressure measurements while exercising on a treadmill machine. The treadmill gets progressively faster and steeper every 3 minutes, for the purpose of increasing the patient’s heart rate to certain target, defined by age and gender. Wear comfortable clothes and tennis shoes. These studies use a device that allows your doctor to monitor record and store heart rhythms over long time periods (Holter for 24 hrs, Event monitor up to one month). “Sticker like” electrodes are placed on the skin of the chest and the monitor is worn by the patient for the duration of test. Monitors provide information about heart rhythm changes over time. They can detect arrhythmias which can present as slow heart beats or fast hear beats of various types, and help you doctor choose the proper treatment. Holter monitors and event monitors are about the size of a cell phone and can be worn attached to a belt or clothing. Nuclear stress testing is used to evaluate for significant blockages in the coronary arteries using images of the blood flow to the heart muscle, also known as “perfusion imaging”. Nuclear stress testing is an office-based test where the patient has two sets of pictures taken of the heart, one during exercise and a second during rest, in order to compare the relative blood flow to the heart under stress conditions. Exercise is usually accomplished using a treadmill but for patients who cannot walk on the treadmill, we use a “chemical stress test” where a medicine is given that simulates exercise by dilating the heart arteries. The images are created using a small amount of a radioactive tracer injected into the bloodstream which travels to the heart muscle and emits energy that can be detected using the nuclear camera. Information about the blood flow to the heart muscle is obtained and differences between the rest and stress images can indicate old heart damage or heart muscle at risk for damage. Pacemakers are small devices, about the size of a cigarette lighter which can generate and deliver the electrical signals necessary to initiate the cardiac contractions. Pacemakers are implanted when the electrical generator of the heart (or “natural pacemaker”) or the electrical pathways of the heart fail or deteriorate. Pacemakers are used to treat patients who have symptoms caused by a very slow heart beat. In most cases pacemakers are implanted during a minor surgical procedure, needing only local anesthesia and moderate sedation. The pacemaker has two components a generator or “battery” which is the part that resembles a cigarette lighter, and the leads, which are very thin cables or wires that connect the generator to the heart chambers and transmit the electrical signal produced by the generator. The generator is much more than a battery; it is a very sophisticated micro-computer that can tell when the heart beat is slow or fast and when to deliver the electrical signals to command to heart to squeeze. In most cases, a pacemaker can take between 30 to 45 minutes to implant. Warfarin, or coumadin, is a blood thinner commonly used to treat many cardiac conditions where blood clots may form, such as mechanical valves, atrial fibrillation, and clotting disorders. This medicine needs to be closely monitored to ensure that the blood is in the proper range of thinness. We have a dedicated coumadin clinic in our office that meets every day, where blood levels (INR or protime) are monitored and doses of coumadin can be adjusted. These studies are useful to determine a patient’s propensity to develop the common faint also known as “vasovagal syncope”. It is done with the patient lying down on a movable table that can tilt upwards from the horizontal position. The heart rate and blood pressure are monitored during the study and changes are recorded, which provide your doctor with information that helps to determine possible causes of the fainting spells.